Metal on Merseyside celebrates six months of handbanging showcases at Maguire’s Pizza Bar, Getintothis’ Nedim Hassan helps himself to a tasty slice of death metal. 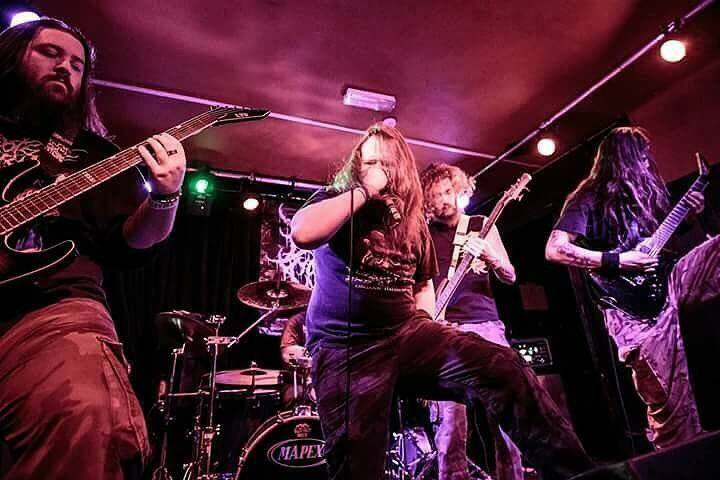 “It feels good to organise things yourself” enthuses Kieron from The Ominous, the band promoting and headlining Metal on Merseyside, a monthly showcase of metal acts from across the region. The event celebrated its six month anniversary last Friday. Tired of being at the mercy of promoters, The Ominous have been venturing into some DIY, hosting gigs at one of Liverpool’s most charismatic DIY venues, Maguire’s Pizza Bar. “We love it here” continues Kieron, a sentiment echoed by the other bands on the bill in their on and off stage chat. It’s not hard to see why; Maguire’s blend of retro chic, love of old-school wrestling (they have screenings of classic pay-per-views every weekend), selection of local beers and, of course, freshly cooked pizza make it a charming setting for a gig venue. The gig space itself is startlingly intimate. With no raised stage, crowd and performers are on the same level and this fosters a collective atmosphere. The small audience of around fifteen for White Mammoth greet the foursome with warmth and enthusiasm. Their softly spoken vocalist describes the band as “prog metal” and they launch into heavier Mastodon-influenced numbers such as Blood Moon and Wrath of God. The band are at the peak of their powers with the longer, gentler Naivety of Perception, which features some excellent intricate guitar work and clean vocals. Vocalist Ben endears himself to the crowd by imploring us to buy some of their stickers so we can decorate our “nans’ house” with them. The crowd has swelled to over thirty as a fog of dry ice ominously envelopes the members of Exhumation during their horror film inspired intro sample. The five-piece then launch into Reprisal of the Obscured and I feel rooted to the spot. Exhumation are unrelentingly heavy and continue to build on the momentum generated by their appearance on the Bloodstock New Blood Stage in 2016. Their captivating performance is a vortex of flying hair and energy as vocalist Chris paces the room and delivers primal screams and guttural roars. The twin guitar attack from Steve and Cam with its clinically precise riffing gives this brutal death metal band a satisfying melodic edge. Devastating blastbeats from drummer Karl, together with Ryan’s pounding bass, drive songs such as Flatline and Sadistic Inhumanity along at a breakneck pace. In between songs, band members lighten the mood with their brand of self-deprecating humour replete with put-downs and ‘yer ma’ jokes (“yer ma goes dogging on a Saturday” Cam tells vocalist Chris). Yet, the overall intensity of their sound feels like it is reverberating up from the wooden floorboards (which are shaking) into my shoes and right up to my teeth. I feel compelled to nod my head in obedience to their power and it is at this point when I have mixed feelings. I feel glad to have my earplugs in to preserve the onset of tinnitus, while wishing that I could grow long hair and head bang properly to their pulverising brand of death metal. Final act, The Ominous take to the Maguire’s stage in jubilant form. This is their party but we are all invited. Numbers such as Freeloader and Isle 43 typify their approach to sludge metal – they hinge upon infectious laid back guitar hooks reminiscent of Southern stoner acts such as Down. These are songs that entice some to ‘get their groove on’ and two girls in the audience duly oblige by jiving and twisting along to The Ominous’ brand of party sludge. What comes across most is the band’s sheer joy at performing on this stage. This rubs off on the audience who can’t help but be left with broad smiles on their faces (as well as the odd pizza crumb). Ultimately a celebration of the Maguire’s venue as much as of metal music, my first slice of Metal on Merseyside was a satisfying one.